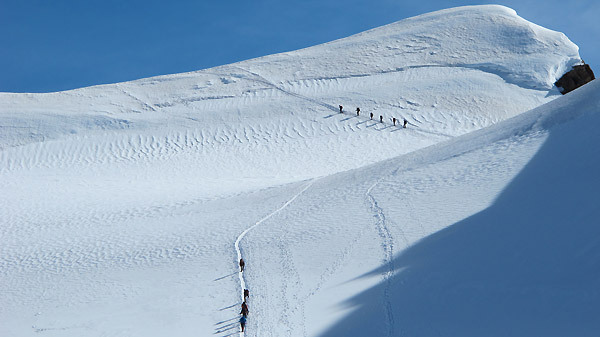 One of the classics and most panoramic ascends of the Monte Bianco. From there you can see one of the most savage areas of the Monte Bianco, the east side. Transfer into the Val Veny and departure at the Lago Combal at 2051 m from where a trail leads to the bivacco Rainetto at 3046 m. From there ascend the snowy ridge, which ends at a small high plateau. Through easy rock scrambling you reach the summit. • Gran Paradiso 4.061 mt. • Capanna Margherita 4.559 mt. 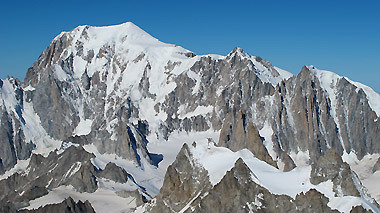 • Aiguille di Toula 3.538 mt. • Petite Aiguille Verte 3.508 mt. • Petit Mont-Blanc 3.424 mt.